Hi friends, I’m back with a tasty vegan date cake. Actually I came back from India in the last week of August itself, but did not feel like blogging all these days. The trip was mostly good except when my son fell very sick when swine flu was at peak there. Thankfully it was regular flu and he is fine now. I thought of meeting all the food bloggers in Chennai but couldn’t organize it with an hectic schedule. Hope to make it at least the next time. On a different note, ladies, do you think that your husband is not appreciative of your efforts you put in the home front? Doesn’t he help you around the house? Then pack your bags immediately and fly to India (or anywhere) and stay there at least for a month and see (enjoy) the respect you get when you come back! Even the simplest thing you do will be noticed by your better half. I’m loving it! I didn’t bake much in the past 2 weeks but for the vegan chocolate cake for my mother-in-law’s birthday (she came with us) and Shilpa’s eggless date cake. 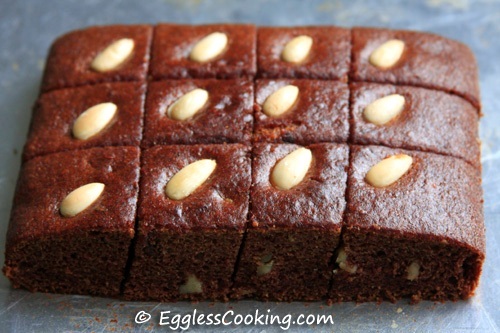 The date cake has been in my to-bake list for quite sometime now. Somehow I didn’t get a chance to bake it until recently. We got a big pack of (Lion brand) seedless dates from India and I wanted to use it up. My son also has started going to school full time and I have to pack lunch for him. He usually eats some fruit or some healthy sweet after his lunch and dinner. So I decided to bake this cake. Vegan dates cake? Does it sound healthy? Does it sound not so tasty? You are absolutely wrong. 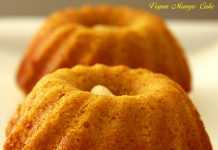 This is the simplest cake recipe one can bake and I can assure you that it’s unbelievably moist and tasty. Remove the seeds front he dates and soak it in warm milk overnight. The next day before baking grind it into a smooth paste along with the sugar adding some more water/milk if necessary. Preheat the oven at 350F/180C for 15 minutes. Grease well an 8×8 inch square baking pan with non stick cooking spray or line it with parchment paper. You may use a circle pan too. In a medium size bowl sift together the flour and baking soda and set aside. In a large bowl pour the dates paste. Mix in the oil and applesauce. Stir in the flour mixture little by little. Use a whisk to mix so that lumps won’t form. The cake tasted very good. I’m sure that I’m going to bake this date cake quite often. It’s a hit with everybody in my family and my mother-in-law has already asked me to bake this for her when she leaves to India. I wanted to try a vegan version because I was having some unsweetened soy milk at home. Sometimes soy milk (some brands) can leave an after taste. So I also added 1 teaspoon of vanilla extract which was not mentioned in the original recipe. You can also try flavoring it with cardamom powder. We had kept the dates in the refrigerator and it was very hard. So I soaked it in 3/4th cup warm soy milk. I left it soaked for nearly 15-16 hours. Maybe that much soaking is not required but I didn’t find time to bake it earlier. I blended it in my food processor with the required amount of sugar and while doing so felt that some more liquid might be necessary. So added another 1/4 cup of soy milk (this is not mentioned in the original recipe). cup of oil is mentioned in the original recipe. 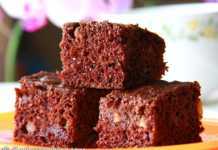 Shilpa also mentions that she has tried baking the cake without oil and it turned out good as well, dense though. So I used 1/4 cup vegetable oil and 1/4 cup unsweetened apple sauce. Measured the oil in liquid measuring mug and the applesauce in dry measuring cup. You can use oil itself. The applesauce is used as a fat substitute. You may try yogurt too. I made it with mejdool dates and the cane out great. I used regular milk instead of soy milk. So I skipped the vanilla extract. The dates were soft. So I was able to blend them within 30 mins of soaking. I’m about to make this, I have a smaller variety. What is the weight of the dates required. Thanks, can’t wait to make it. Sorry Aarthi, I’m unable to tell the quantity in weight/grams. I have not used that measurement so far while baking. I needed to find something that was relatively easy to make for 2 vegans who always miss out on my cakes because I haven’t attempted anything suitable for them. I did use regular apple sauce from Aldi which was sweetened and may have had an effect on the overall sweetness of the cake but not in a detrimental way. I also skipped out the almonds on top. Despite having no eggs, I was surprised at the rise and it really wasn’t too dense at all. Great recipe – many thanks! This looks awesome! one question.. how necessary is the soaking of the dates the night before? I’m a spaz and will forget to leave them soaking. Or what’s the minimum time I can leave them, like a couple of hours or so…? before starting to prepare it? or will it change the cake too much? I haven’t tried it without soaking the dates or soaking it just for a couple of hours, so not able to answer the question. I guess if it’s very soft dates just 1-2 hours of soaking should be fine because it will be easy to blend soft dates. You can use oil itself or maybe equal quantity of mashed banana. Yes any milk can be used. I always make this cake , but want to know how to make it very fluffy like the ones we get from cake shop? This cake won’t come fluffy because of the dates. It will be dense only Bhavya. Can you tell me the actual proportions of the cake you had made, because my dad likes dates cake a lot. I will try as you have done. Please check the recipe above as I have updated it. This really look great, I’m going to try it tomorrow! 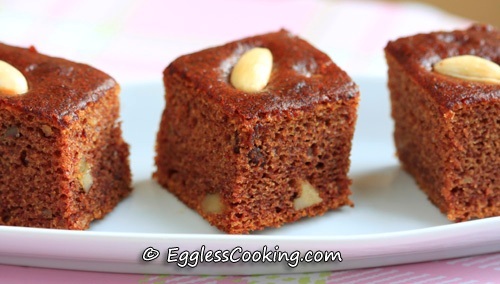 Do you have a recipe for an egless wholewheat date cake ? Follow the link in the recipe and you will find the recipe. Hi, I was wondering what difference it makes if i use a mixer instead of a spatula, since you mention mixing all the ingredients with a wisk or spatula for most of your reciepe? By the way I tried making your eggless vanilla cake and it turned out amazing. Thank for your wonderful website. What happens with using a mixer is, sometimes we rev up the speed and this will lead to over mixing and will result in a tough cookie or a dense muffin/cake. So I usually use a mixer only for creaming butter and sugar and the rest of the mixing is done with a spatula or a whisk. Thank you, i’ll remember that for next time. I also had another question, if the recipe says to use veg oil can I use canola oil instead or will it alter the taste drastically? You can use any neutral oil (including sunflower, safflower, grapeseed) interchangeably without affecting the taste. I would like to know how to mix the dry and wet ingredients? In the original recipe from aayi, it says mix the ingredients slowly by adding 1 spoon of flour at a time. Should i do it with a spatula or can I use a hamilton hand mixer? 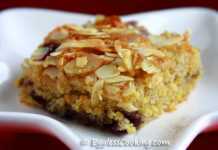 Hi Divya, I don’t mix it a spoonful at a time but in 3 additions totally and the cake turns out great. Don’t use a mixer though, spatula should be just fine. That’s great to know Neela. Why don’t you register with Eggless Cooking’s forum and share your recipe there under the respective category. Please check the recipe above.